Thanks to Philip for the link!!! Facing ever-faster missiles and increasingly complicated air threats from China and Russia, the U.S. Navy is moving toward a major upgrade to its stalwart Arleigh Burke destroyer fleet. 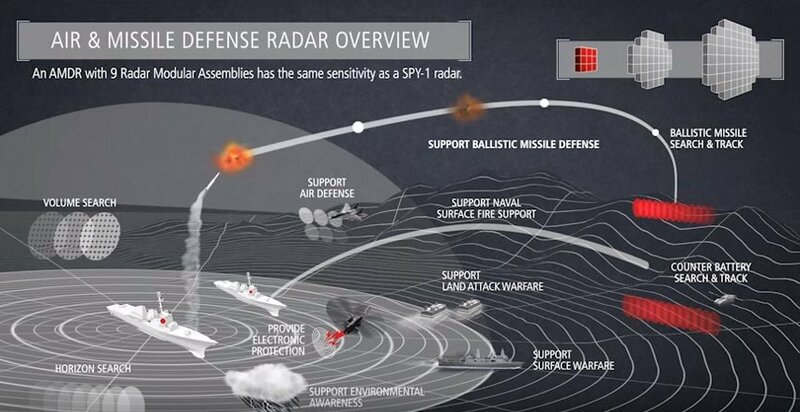 The service is planning to buy a scaled version of Raytheon’s SPY-6 air and missile defense radar to replace the SPY-1D arrays on the Flight IIA destroyers, Defense News has learned. The upgrade will bolster the radar sensitivity and sophistication of the Flight IIA Burkes. The move is likely prompted by the Navy’s concern about the proliferation of anti-ship cruise missiles with sophisticated evasive maneuvers and ever-increasing speeds, investments that China and Russia make no secret about pursuing. In a statement, the Navy acknowledged it was pursuing the SPY-6 array upgrades as part of the 2020 budget. “Per the President's Budget submission for FY2020 Navy will begin procurement of 24 Radar Module Assembly (RMA) SPY-6 radar sets, and associated electrical and cooling equipment in FY2022, for installation in a DDG Flight IIA beginning in FY2025. The specific hull will be named later,” the statement reads. I did a very limited search of the web to find out about this thing and it's impressive. We're gaining alot of capability at a better price. In other words a big win. What gives me even greater joy is that this radar is based off the same tech as the G/ATOR so it's gonna be effective across the spectrum but just bigger and more effective. I haven't been clued into the "electronic" side of things but this is a combat multiplier. Side note. If we can get the Navy to bite on an extended range shell for their naval guns this this could get us additional help onshore. If nothing else it should be able to help us with counterbattery even if it's not gonna be the "shooter".